The Circuit de Barcelona-Catalunya was host to the second round of the Spanish RFME Campeonato de España de Velocidad National Championship. 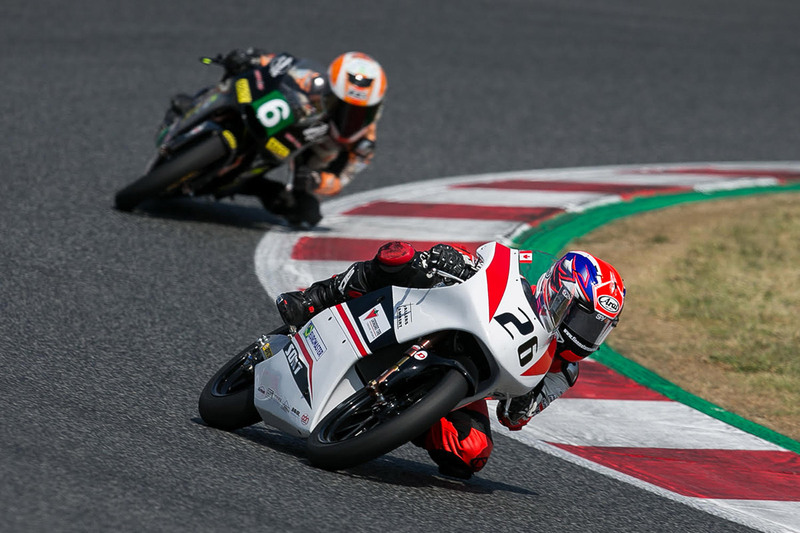 Canadian GP85 class rider, Jonathan Finn, was looking to improve after engine problems resulted in a DNF during the first round at Circuit de Ricardo Tormo in Valencia last month. The three practice sessions on Friday were plagued with red flags, which took away any real opportunity for Finn and his XCTech Team to progress with the bike setup. “Friday was really disappointing for me. 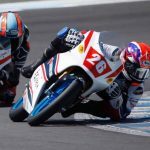 With this being my first year here racing in the RFME CEV series, the best thing I can do for my own development is to just put in the laps during practice and learn these tracks” said Finn. Although he had little track time Finn was still able to improve his lap times by 5 seconds. Saturday’s morning QP1 session would see Finn continue to improve his lap times however the afternoon QP2 produced little progress. “During QP1 everything was feeling really good. I was able to push and continue to improve my times. With the track conditions improving, I was really looking forward to making a good run in QP2. Unfortunately during the afternoon qualifying session my BeOn GP85 bike felt and handled different. It was like learning to ride a completely new bike. The team and I tried a couple of changes to find a setting that would work but just ran out of time,” said Finn. For race day, Finn would still struggle with untimely gremlins. During the warm-up lap, Finn noticed some unfamiliar movement in his clutch lever. “It was strange, the first couple of corners during the warm-up lap the tension on the clutch lever seemed different and I thought it was my mind playing tricks. But when shifting became more difficult I knew there was something wrong” said Finn. “Instead of lining up on the grid, I knew that this was a potential safety issue to I came onto pit lane to have my team look at it.” Finn was right, a missing clutch lever bolt had come loose, which affected his ability to shift properly. “Its definitely not the way I wanted to start the race but my XCTech Team fixed the problem really fast and got me out on track.” The race had already started and Finn was behind by 30 seconds. “All I could do was put my head down and push hard to race the clock and inch my way forward.” The gap proved to be too much for Finn to have any chance at battling for position, however his drive allowed him to continue to improve his lap times over the distance of the race. “Its unfortunate that this happened but it’s racing” said Finn. 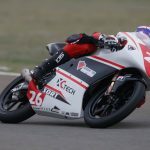 Jonathan Finn will remain in Spain as the RFME CEV series travels inland from to Circuit d’Alcarràs near the city of Lleida, Spain for the only double round of the season this coming weekend (3-4 June). Finn and the XCTech Team are eager to put this weekend behind them and focus on progressing forward.